Does anyone have any good advice to offer, from experience, at what temperature bananas are subjected to chilling damage? From your experience, do you agree with this chart? Thanks, and I am looking forward to hearing from you. This post is filed under Transportation, Packaging and Storage. I don’t know just exactly how long it takes to chill bananas but most of time it doesn’t show up until they warm up. 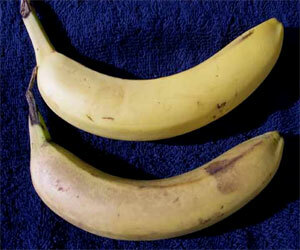 When bananas are exposed to temps below 45, you can pretty much guarantee the gray discloration will show up. 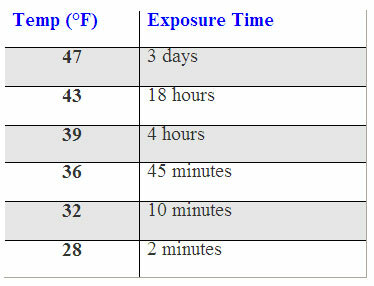 I am not sure how much time they need of exposure at this temp. This is a great topic….maybe some expert will write in. Thanks for the help with the chilling question! Very much appreciated.